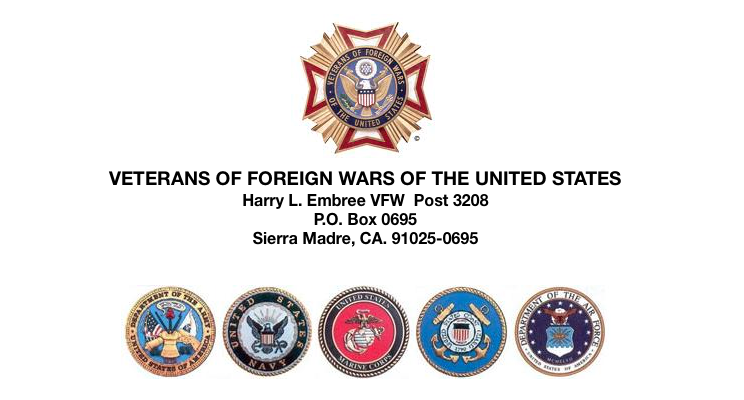 Sierra Madre Harry L. Embree VFW Post 3208 invites patriots, families and friends to attend our Memorial Day Ceremony honoring our deceased War Veterans at Sierra Madre Pioneer Cemetery, Monday, May 30 at 11:00 A.M. Please arrive early to get a seat. In recent years, the ceremony has attracted standing-room only crowds. A sandwich lunch will be served following the ceremony, courtesy of Post 3208. Patriotic and WW II music will be played before and after the ceremony. Guest speakers and/or participants will include CA VFW 4th District Commander Dave Loera, keynote speaker former Mayor and City Councilwoman MaryAnn MacGillivray, Congresswoman Judy Chu, CA State Assemblyman Chris Holden, and other past and current officials. We hope to see many of you there. Thank you for your continued support and interest! God bless America! Not the time or place, 1:19. This is always a stirring ceremony. Be sure to bring the young people in your lives to help them learn why we celebrate Memorial Day. Last year there were lots of white headed people in the audience, very few youngsters. I agree. This is tradition. It must be passed on. I make it a point that my kids learn about this country's history and why we honor our veterans. But you're right, the lack of younger generation at Memorial Day events is pretty sad. Saw about 4 kids at the Vietnam War wall unveiling at Arcadia Park on Sat. Can anyone explain why the 1000 flags at Arcadia park were removed today and not left up for Memorial Day? The dedication of the new Vietnam memorial wall was excellent.